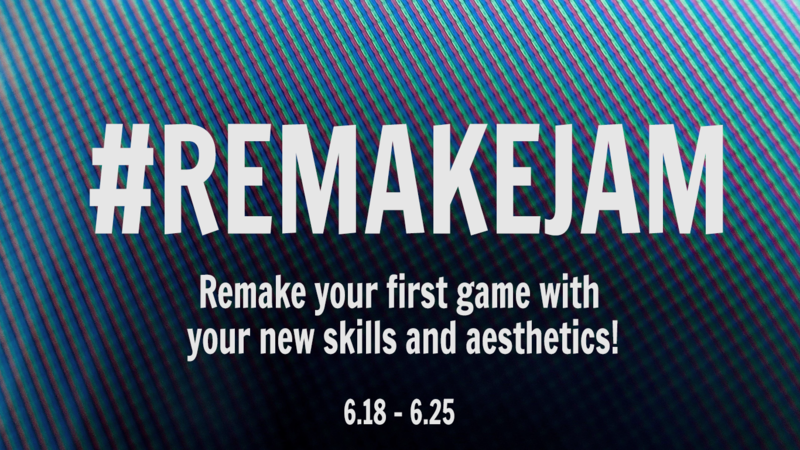 #RemakeJam is a game jam where you remake your very first game! #RemakeJam invites participants to contextualize themselves and their current state as game-makers by recognizing their past work and how they've grown. Jammers shall use the duration of the game jam to remake the very first game they created, adapting them to use any new skills, aesthetics, or techniques they developed since they started. In doing so, we hope that jammers can be inspired by how they've grown and evolved as creatives. Take on an extra challenge! Thank you to @aquma for helping brainstorm these diversifiers! Makeover: Keep the same code but replace the art. Reboot: Remake your game in a different genre. Futurist: Use tools or hardware that did not exist when you first made your game. Window to the Past: Includes an option to play the game with original graphics. Take a Stand: Game reinterprets or reconsiders its message for modern times. Inclusive: Build your game to fulfill at least Intermediate Game Accessibility Guidelines. Accessible: Game plays well on low-end machines or browsers. Questions? Tweet me @thatkevinwong or check out the community tab! Link up with other jammers on Discord. Help two spirits get through a forest full of puzzles. Scramble your spitfire and defend the local factory for as long as possible! Tally Ho! Came to eat chicken nuggets and kill zombies... and im all out of chicken nuggets.PEWPEW! A Platformer-Shooter Game i developed for #RemakeJam and it's a remake of my first ever "playable" game. A paltformer where you can jump in the air! Acuadoy was my first game! Now I redid it for the #RemakeJam. You're the last rectangle. And You want tea. Hunt in the night with three friends as a pack of wolves. The classic arcade game asteroids played via mouse and keyboard. ​All attempts at diplomacy have failed! Jumper Jack is buggy and is a prototype. You are being chased! By Ghosts! Made for #RemakeJam 2017, at least its not an asset flip.